The Spokane Horseshoe Pitchers Association holds an annual tournament this weekend at Franklin Park. Horseshoes fly through the thick, acrid smoke blanketing Spokane on a recent Friday afternoon, tossed by a mother-and-daughter duo to whom the backyard game is more than mere leisure. On this particular day, Kaiti Reeves, a former state champion, is practicing for the following day's Bellingham International Tournament along with her mother, Cindy Reeves, president of the Spokane Horseshoe Pitchers Association. The occasional cough from the pitchers — air quality at the time was listed as unhealthy — hinted at their dedication. The Reeves' devotion to the sport runs deeper than just a commitment to practice; it goes down to the very ground on which they play. "We rebuilt all of these [horseshoe pits] about six years ago because we hosted the state tournament here," said Cindy Reeves of the Franklin Park pits. You have a chance to see that dedication in person on Saturday when competitive horseshoe pitchers from around the region converge on the pits at Franklin Park for the Earl Kettleson Night Tournament, the last of the year to be held in our region that is sanctioned by the Washington State Horseshoe Pitchers Association. "It's awesome. It's nice and cool, and we turn the lights on and we're playing from about six o'clock until midnight," says Cindy Reeves. 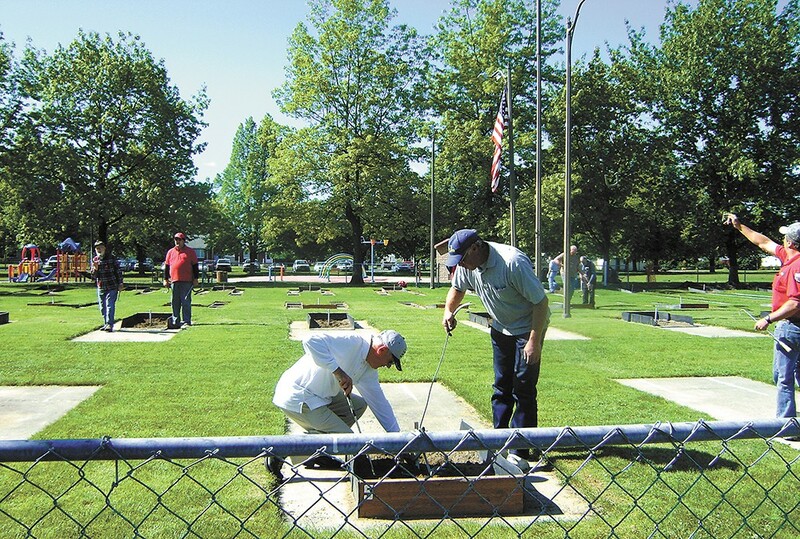 The 24 pits at Franklin Park serve not just as the tournament site, but also as the home ground for the Spokane Horseshoe Pitchers Association. From May through September, the club meets on Wednesdays at 6:30 pm for league nights, which are open for the public. "On Wednesday nights anybody can come in and play," said Kaiti Reeves, tournament director for the Spokane Horseshoe Pitchers Association. There is a $15 annual membership fee to join the club, which goes towards maintaining the grounds at Franklin Park, setting up tournaments and paying for trophies. But with only two Wednesdays — the 2nd and 9th of September — left this season, anyone who is interested is welcome to try their hand free of charge. All you need to do is show up, no equipment needed. Don't worry about tracking down a horse to give you its used shoes, because the Reeves have extra. The club, which hosts three tournaments each season, has been active in Spokane for more than 50 years. But it's not all good news for horseshoes in Spokane. Horseshoe pits may be found in parks around the city, but the parks department website doesn't make it easy to locate them. Pits in Manito Park were torn out years ago and replaced with nothing but grass. This is the harsh reality facing horseshoes today. There is an obvious difference between general perception of the sport and the active, competitive scene operating on local, state and national levels. At the same time, interest in the sport has dwindled locally. "We used to have 15 to 20 people on Wednesday nights," said Cindy Reeves. "Right now we have hardly anybody."